commercial & industrial guttering ranging from guttering on a office building to a large box gutter on warehouses and factories. We specialise in seamless aluminium guttering, aluminium rainwater pipes, cladding and roof drainage systems, ranging from guttering on an office building to a large box gutter on warehouses and factories. We provide a range of roofing & maintenance services for all types of businesses, we regularly work with schools, building contractors and other commercial & industrial businesses. We are experienced in high level maintenance and regular hire in access platforms – we are IPAF trained. We clean, repair and install new guttering on all types of commercial and industrial business premises; including high level access. Approved installer for HD Sharman gutter refurbishment system. 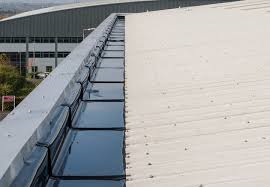 We repair and refurbish all types of guttering commonly found on industrial buildings, factories & warehouses. Plygene Gutterline is the only BBA approved gutter lining system specifically engineered to restore and preserve gutter performance for industrial and commercial buildings. 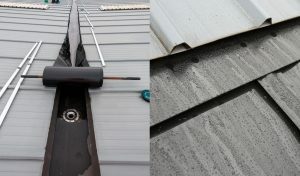 Providing a 25 year guaranteed, BBA approved, “gutter within a gutter” system, Plygene Gutterline offers a bespoke solution with minimal building disruption and is an effective alternative to full gutter replacement. Specifically engineered for the gutter environment, Plygene Gutterline provides complete peace of mind for contractors and building managers who need to stop leaks for good. Guaranteed for 25 years – BBA certified – UV certification. Been an established roofing contractor we can help you with any issue you have with your flat or pitched roof.